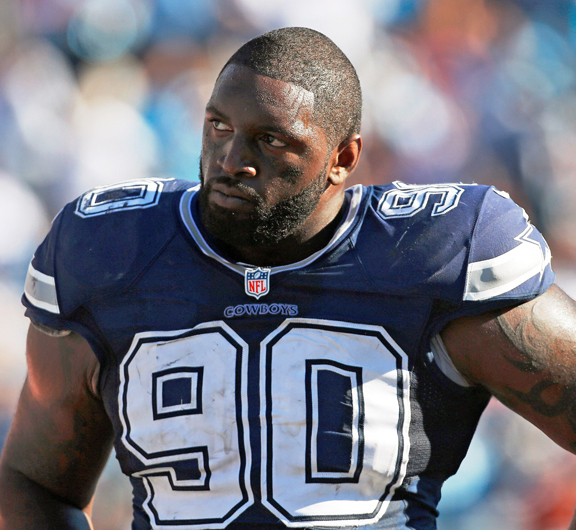 IRVING, Texas (AP) -- Jay Ratliff's mysterious and rapid decline with the Dallas Cowboys has ended with his release. The Cowboys unloaded the apparently disgruntled defensive tackle on Wednesday, saying he failed a physical after spending the first six weeks of the season on the physically unable to perform list. He was eligible to be activated this week. Ratliff missed the last six games of 2012 with a groin injury that required surgery. The four-time Pro Bowler injured his hamstring during the conditioning test before training camp in July and never practiced for the Cowboys this season. But Ratliff tried to put a happy face on his departure in a statement issued by Slough, thanking ''the best fans in the NFL'' and giving owner Jerry Jones credit for ''taking a chance'' on a seventh-round pick from 2005 who went to four straight Pro Bowls. The team said Ratliff had sports hernia surgery and expected him to be ready in 2013, but Slough said doctors told him the injury was far more serious and could take up to a year to heal. He described the injury as muscles tearing away from bones in the pelvic area. Slough said he and Ratliff ''never felt the need'' to clarify his injury, even with his client getting criticized over the slow recovery time. ''If it doesn't bother my guy, then I guess it doesn't bother me,'' said Slough, who said several teams have already contacted him about Ratliff, but that the 32-year-old won't play this season. The agent also said Ratliff wasn't leaving the Cowboys on bad terms. Slough said Jones called Ratliff to tell him about the release. Ratliff made the Pro Bowl as recently as 2011, but ended up missing 10 games last year. A sprained ankle kept him out of the first four, followed by the groin problem. After his injury-filled 2012 season, Ratliff was arrested on suspicion of driving while intoxicated in January, just weeks after teammate Josh Brent was charged with intoxication manslaughter following a car accident that killed practice squad player Jerry Brown. In his four-year stretch of Pro Bowl appearances, Ratliff twice had a career-high 83 tackles and 19 of his 27 career sacks. But he had just two sacks after signing a five-year, $49 million extension in 2011. He will count $7 million against the salary cap next season even after agreeing to have his deal restructured this past offseason. Ratliff will be off the books in 2015. With star pass rusher DeMarcus Ware battling a quadriceps injury, it's likely Hatcher will be the only one of the four projected starting defensive linemen on the field Sunday when Dallas visits Philadelphia. Anthony Spencer, the end opposite Ware, is out for the season after knee surgery. And now they know Ratliff won't join them. ''It's unfortunate that he didn't have the opportunity to play in this new defense because I think he would have done well,'' Slough said. ''I know the Cowboys thought he would flourish in that defense. They felt like it would extend years on his career. But the injury got in the way, and that happens in the NFL.